John Augustus Reitz was born on December 17, 1815, in Dorlar, Prussia. He grew up in a German family that emphasized skill, thrift, and hard work. He came to the United States in the 1830s when many other Germans came, and for the same reasons: to find better business opportunities and a more “republican” form of government. In 1839, Reitz married Miss Gertrude Frisse, also a native of Prussia. Between 1841 and 1863, the couple had ten children. Two of Reitz’s sons joined him in the sawmill business. 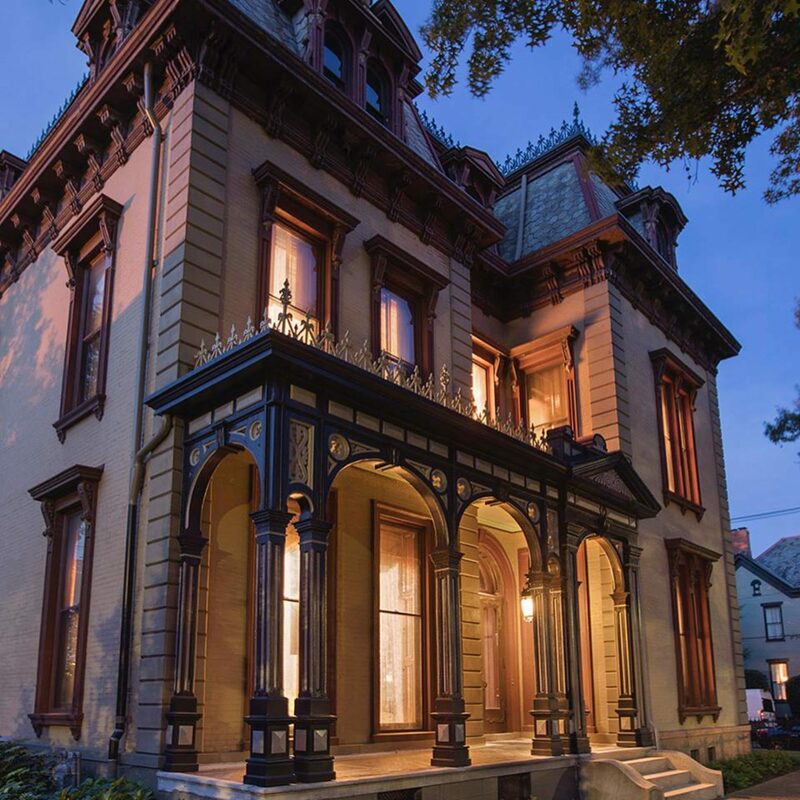 Reitz’s magnificent First Street home was completed in 1871. His family then consisted of Francis Joseph, Christine, Josephine, John Jr., Wilhelmine, Mathilda, Louise, and Edward. Two daughters, Julia and Mary, married in 1864, and were already in homes of their own by then. Ten years after the house was built, John Jr. married and moved into a home of his own. None of the other children ever married; they continued to live in the house together. The name of John Reitz is indeed a synonym in Evansville for that which is honorable and progressive in business, yet he never allowed personal interest or ambition to dwarf his public spirit. His breadth of view not only saw possibilities for his own advancement, but for the city’s development. John Augustus Reitz passed away in 1891, and Gertrude died two years later. Francis Joseph and his four maiden sisters redecorated the interior of the First Street house with late period Victorian furnishings plus some aesthetic movement style and arts and crafts style furnishings. They also incorporated the newest technologies, including electricity and indoor plumbing. Today, the Reitz Home is noted as one of the country’s finest examples of Second Empire architecture. Authentic period furniture, much of it original, is arranged as if the family is about to return. Silk damask-covered walls soar to decorative hand-painted ceilings and delicately molded plaster friezes. French gilt chandeliers shine down on one of the home’s most beautiful features: the intricately patterned hand-laid wood parquet floors. The home has tile and marble fireplaces, walnut wainscoting in Moorish design, and glowing stained glass window panels. Christine, the last member of the Reitz family, died in 1931. Two heirs, John Fendrich and Laura Fendrich McCarthy, took over the estate to assure that the house was preserved. In 1934, they donated the home to the Daughters of Isabella, a Catholic women’s organization. The Daughters of Isabella used the home as a community center and rented out the bedrooms to businesswomen working in the downtown area. In 1945, the Evansville Diocese purchased the home from the Daughters of Isabella for $22,000 and established it as a residence for Evansville’s first bishop, Henry J. Grimmelsman. Bishop Grimmelsman lived in the house and used it for the Office of the Chancery. After Bishop Grimmelsman died, the diocese considered putting the home up for sale. It was at this time that the Evansville Junior League started a movement to preserve the property and establish it as a house museum. The Reitz Home Preservation Society was formed in 1974, and the property was given over to its care by the Evansville Diocese. The home was placed on the National Register of Historic Places. In 1993, The Publication Competition, given by The Ohio Museums Association, gave the Reitz Home Preservation Society an Award of Distinction for the “Reitz Interpretive” video. In May 1999, the Reitz Home Preservation Society received a Historic Preservation Award from Preservation Alliance of Evansville for the restoration work on the exterior and interior of the Carriage House. At the Annual United Way of Southwestern Indiana Volunteer Award event, April 23, 2002, Vectren presented the Volunteer of the Year Award to the Reitz Home Guild.